The Fontaine Chair Mink Velvet is a wonderful design with luxurious qualities that will shine in the dining room, bedroom, and beyond. Delivering an element of magnificence to your interior, the Fontaine is ideal for those looking to make a dazzling statement. Exquisite mink velvet covers the padded seat, which has a sprung and belted frame for superb comfort. A tall backrest lends a grand appeal and wraps around the seat for an encompassing feel. 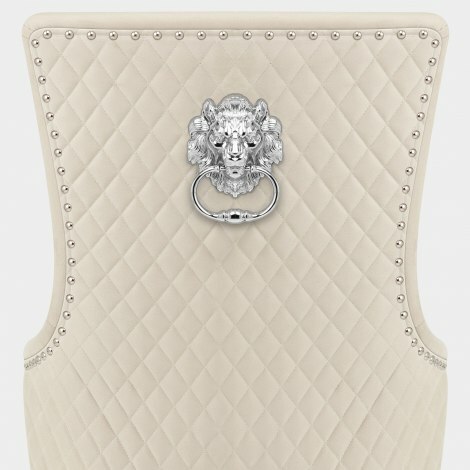 The rear is adorned with diamond stitch detailing and chrome stud edging, whilst a feature lion ring knocker completes this truly opulent look. Four polished chrome legs support the seat and reflect the chairs surroundings, adding a contemporary edge to the design. Protective pads are also included beneath each leg to help keep your floors in pristine condition. "Absolutely love my new chairs"
Love my new chairs the look so expensive and they are really comfy. Over the moon with them. Product exactly as described/photo. Delivered next day as promised. Well packaged and great tracking facility. Only had to attach legs. Great value. Would definitely recommend and use again. The chairs are lovely on the website and definitely live up to expectation in real life. The chairs are absolutely gorgeous and comfortable to sit on. They were also easy to assemble. Absolutely love my new chairs. Fab service and very fast delivery. I would definitely recommend this company.